I recently bought a new enlarger, well an old one actually, but it’s new to me! It’s a DeVere 504 with an Ilford MG500H head. It was a chance conversation before the show opened one day at Focus on Imaging at the NEC in March, with Mike McNamee, the Editor of Professional Imagemaker magazine, that started the ball rolling. It was his personal enlarger and he hadn’t used it for years and wondered if it was any use to me. A bit of bargaining later Jan and I collected it from his house on the Wirral and it’s now fully installed in my darkroom, as you can see from the photo (taken with Jan’s Nikon D90). The DeVere came with an old 500C keypad that doesn’t have any memories so I switched it for the spare 500CPM keypad that I happened to have. This is what I’m used to using and having 9 memories makes all the difference when using split grade printing, as I do for every print that I make. The 504 also has the advantage of baseboard focussing. My old Durst 138S doesn’t have this and making big prints can be a bit of hassle getting the focus correct, I can’t reach the focus knob next to the lens while looking down the grain magnifier on the baseboard. The Durst is still a great enlarger though, I bought it from the ex-Ilford Head Printer Mike Walden 4 years after he retired from Ilford. He decided that 40 years working in the dark was long enough for anyone and sold all of his personal darkroom gear, mostly to me! I’m still getting used to the DeVere. It is easier to use than the old one but I prefer the bigger baseboard and negative carrier on the Durst. The Durst chassis is much older than the DeVere but the head on the Durst is newer. They both work the same though. 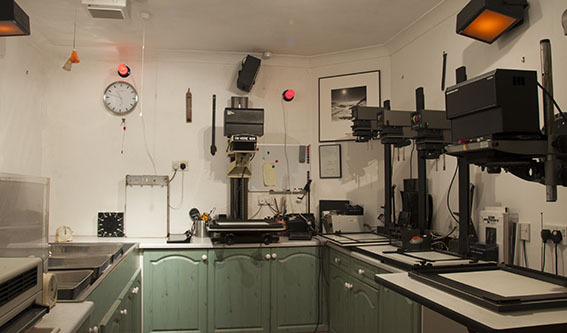 That makes 2 enlargers with Ilford MG500 systems in my darkroom, as well as 3 Durst M670’s. I either do 1-to-1 private courses or group courses for 2 people, so you have even more choice when it comes to enlargers. The MG500 heads print all negatives up to 5 x 4 inches in size. The M670’s print negatives up to 7 x 6 cms. Thank you Mike for your hospitality on collection and generosity. Hopefully it will now give many more years of use as I have no plans to switch to digital cameras from my Mamiya 7’s anytime soon!